In a long-awaited New Year’s Eve match-up, there will be six Terriers on the ice as Team USA and Team Canada meet to determine the top seed in the B Division of the World Junior Championships. Dante Fabbro will wear the Maple Leaf and take on BU teammates Clayton Keller, Charlie McAvoy, Jordan Greenway, Patrick Harper and Kieffer Bellows. Jake Oettinger again will be a scratch for Team USA. Puck drop at the Air Canada Centre in Toronto is at 3:30 p.m. ET. NHL Network and TSN will air the game. Daily Free Press writer Jonathan Sigal talked with 2017 recruit Ty Amonte--for a NE Hockey Journal feature--about the path that will lead him to Commonwealth Avenue next fall. 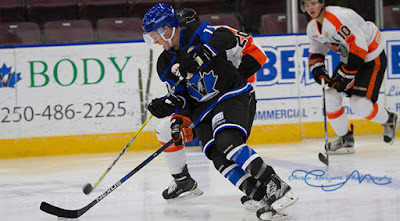 The former Thayer Academy standout is spending a season in the BCHL and has 29 points in 36 games for the Penticton Vees. On Dec. 31, 1994, BU defeated Minnesota, 4-3, on Ken Rausch’s overtime goal to win the Mariucci Classic. The win was the first of four tournament titles culminating in the 1995 national championship. Rausch (bio) is currently Director of Youth Hockey for USA Hockey as well as general manager of the NTDP U17 team. Clayton Keller scored a goal and assisted on another as Team USA edged Russia in a preliminary round game at the 2017 World Junior Championships. The win sets up a New Year’s Eve duel with Canada with first place in Division B on the line. Puck drop is set for 3:30 p.m. ET. The Terrier freshman put the U.S. on the board four minutes into the game taking a pass below the left circle, deking a defender and sliding home a backhand shot. With the score tied in the second period, BC’s Colin White scored on the rebound of a Charlie McAvoy blast from center point, with Keller notching the second assist. Denver’s Troy Terry would provide the eventual game-winner later in the period. Keller is Team USA’s top scorer with five points (3G,2A). He’s tied for eighth overall in the tournament. Team Canada kept pace with the U.S., thrashing Latvia 10-2 with Dante Fabbro picking up his first point of the tournament. Fabbro is +3 with six shots on goal and no penalty minutes in three games. ►► BU Head Coach David Quinn confirmed that goalie Max Prawdzik will spend second semester playing junior hockey in the NAHL and announced that newly enrolled freshman Nico Lynch will assume his spot as third netminder. 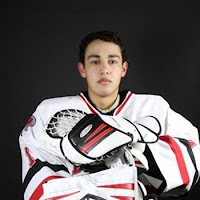 Lynch played three seasons of Tier 1 Elite hockey for Boston Advantage and, as a senior at Barnstable HS, earned team MVP honors with a 1.80 GAA and was named to the Boston Globe All Scholastics Old Colony Conference All-Star Team. Prawdzik is expected to return to BU next fall with sophomore eligibility. The Waterloo-Cedar Falls Courier spoke with 2017 recruit Shane Bowers about the Halifax, Nova Scotia native’s decision to pursue college hockey rather than play in the QMJHL. The 6-1 center currently has nine goals and 10 assists in his second season with the Waterloo Black Hawks. 2019 recruit Case McCarthy is ranked #4 for the upcoming OHL draft by Hockey Prospect.com . The 6-1, right-shot defenseman has a 3-17-20 scoring line in 23 games for the Buffalo Junior Sabres 16Us. A pair of 2020 recruits--both sophomores in their first year of New England prep hockey-- are off to strong starts. Braden Doyle has eight assists in seven games for Lawrence Academy. The left-shot defenseman from Lynnfield, Massachusetts had 46 points last season for the Shattuck St. Mary’s Bantams. Center Trevor Zegras has a 5-7-12 scoring line in nine games for Avon Old Farms. NeutralZone.net, analyzing the top performers at the Avon Old Farms Christmas Classic, gave Zegras an “A” grade for his efforts. Eric Gryba’s first goal of the season was the also the first game-winner of his NHL career. The defenseman from Saskatoon batted a puck out of the air in the Oilers’ 3-1 win against Los Angeles. Wade Megan recorded his first hat trick as a pro in the Chicago Wolves' 6-2 win against Rockford. The former BU captain, who scored a goal on his first NHL shot during a recent call-up to St. Louis, leads the Wolves with 17 goals and is also tied for the AHL lead. Danny O’Regan scored his eighth goal for the San Jose Barracudas in their 4-1 win against Bakersfield. He leads the Barracudas in scoring with 28 points and made his NHL debut earlier this month. David Warsofsky has been recalled to the Penguins from AHL Wilkes Barre/Scranton. He leads the Baby Pens defensemen in scoring with 21 points in 20 games. 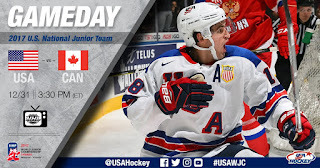 Team USA defeated Slovakia, 5-2, for its second preliminary round win in the World Junior Championships. Assistant captain Charlie McAvoy had a goal while Clayton Keller and Kieffer Bellows each contributed an assist. 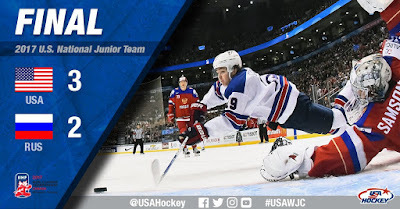 In the first period, Keller set up Team USA’s second goal with a perfect saucer pass to BC’s Colin White to complete a 2-on-1 break. In the second period, Bellows found UConn’s Tage Thompson in front of the Slovakian net for what would be the game-winner. Six minutes later, McAvoy one-timed a rocket from center point for his first goal of the tournament. Keller would have two goals disallowed in the third period—the first because of uncertainty whether the puck crossed the goal line; the second because Keller was ruled to have pushed the goalie and puck into the net at the end of a breakaway. A lengthy NHL.com feature between the second and third periods—virtually a BU infomercial—focused on the Terriers having six players on the US squad, a feat last done in 1979. 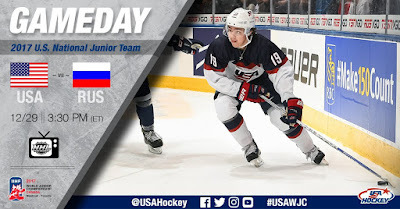 Team USA is back on the ice this afternoon to face Russia at 3:30 p.m. ET. Russia has a 1-1 record after having dropped the opening game to Canada. NHL Network and TSN will air the game live. 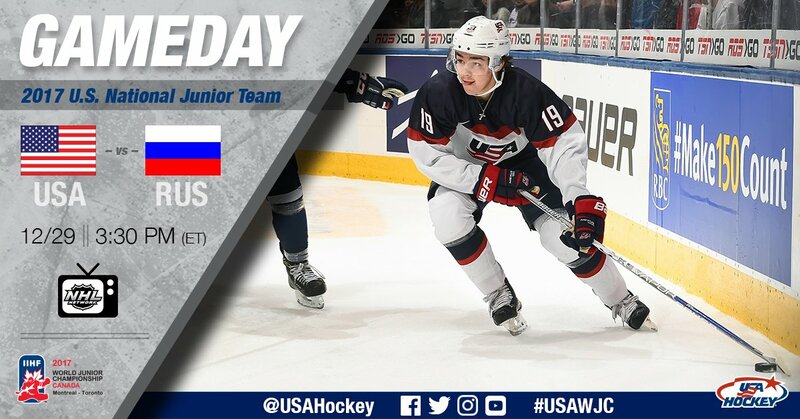 Dante Fabbro and Team Canada take on Latvia at 8:00 p.m. ET tonight and should go into Saturday night’s game against Team USA with a perfect 3-0 record. Fabbro has no points and 3 shots on goal in two games. 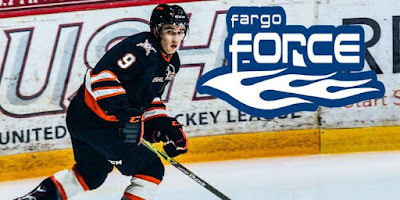 2017 recruit Hank Crone scored his 9th and 10th goals in Fargo’s 5-2 win against Cedar Rapids. The speedy left wing has a team-best 26 points in 22 games for the Force and is tied for fourth among USHL scorers. Kevin Shattenkirk scored his eighth goal of the season as St. Louis doubled up Philadelphia, 6-3. The former BU captain has 24 points in 36 games.